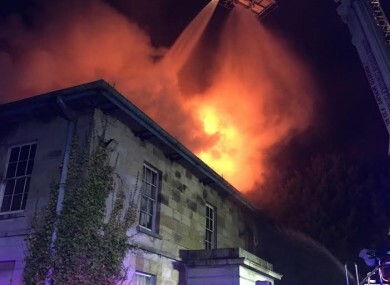 GARDAÍ ARE INVESTIGATING a suspicious fire at a landmark residence owned by a brother of billionaire horse racing tycoon JP McManus. The eight-bedroom manor, Kilmoyle House, was the former residence of Catholic Limerick bishops but has not been occupied for years. Gerry McManus, a brother of well-known philanthropist and racehorse owner JP McManus, purchased it in 2014 for an undisclosed price after it went on the market for €1.1m. It was sold by property developer Aidan Brooks who purchased it in 2007 for €26m making it one of the country’s most expensive properties. Brooks had previously planned to build a nursing home and retirement village on the site. It’s believed Gerry McManus was planning to carry out remedial works at the historic house. In 2015, a planning notice at the property stated that Gerry McManus intended to apply for planning permission for seven works on the site. The notice stated that he wished to remove late 20th century house extensions and outbuildings, make modifications to the existing house, construct a gate lodge near the entrance, construct courtyard buildings, construct an underground garage, and make repairs and alterations to the site boundaries. Brooks, (46), also from Limerick, but who runs a vast property portfolio from London, retained five acres of land around Kilmoyle House, leaving one acre as part of the sale to McManus. He also owns Portland House, the former Church of Ireland’s bishop’s residence, located next door. Firefighters attached to Limerick city and county fire service fought the flames for four hours before bringing it under control. “Two fire trucks, and a water tanker vehicle were dispatched to the scene. On arrival the house was well alight,” said a source. “The house has been extensively damaged. Gardai have sealed the house off pending a technical examination this morning,” the source added. Mayorstone Gardai are investigating the circumstances surrounding the cause of the fire. Email “Gardaí investigating fire at landmark manor owned by JP McManus's brother”. Feedback on “Gardaí investigating fire at landmark manor owned by JP McManus's brother”.